I have an upright freezer, a chest freezer and a small freezer attached to my refrigerator. And they are all full most of the time. There are even some days I wish I had another one. Why do I love my freezers so much? A freezer can save you time and money, and it can keep you and your family eating healthier. I love to cook and I love to bake. But with two small children I don’t have time to cook elaborate meals or make a new batch of baked goods every day. So when I do have the time I make large batches of food and then freeze them for the days I need something quick. This also ensures that I feed my family healthy food. On days that I’m in a rush I don’t have to grab something processed, or packaged. I can just grab something from my freezer that is homemade, and this helps me the most when it comes to breakfast. I keep things like homemade muffins, bread, bagels, granola bars, breakfast cookies and granola in my freezer at all times. Then I can just pull something out the night before and pair it with some fresh fruit or yogurt for breakfast in the morning. Simple, healthy, and breakfast is ready whenever you need it. It is also very convenient to have some dinners in the freezer. Stocking things like cooked ground beef, cooked shredded chicken, sloppy joes, casseroles and homemade broth in the freezer allows for quick and easy dinners. The next time you’re making lasagna for dinner, make two. You’ll be glad to have it on hand for a busy day when you don’t have time to cook, but want a nice meal. Eating high quality food can be expensive, but it is cheaper when you buy in bulk. I buy most of my meat in bulk each spring when we buy a large portion of beef that lasts the whole year. I also buy quite a few chickens every year that I cut up and package in individual pieces. This year I also bought a half pig. It is so much cheaper and healthier to buy good quality meat in bulk. Plus it’s nice to never have to worry about not having meat in the house. It is also a big money saver to buy produce when it is in season. All summer I stock up on fresh, local produce at the farmer’s market and grow some in my own garden and freeze it. Then we enjoy it all year long. Even in March, we are still enjoying strawberries, blueberries and cherries from last summer! We even have 6 gallons of beans from our garden left. This is the best way to get produce at its cheapest. You don’t have to buy things like frozen fruit or vegetables during the winter and you’ll also be enjoying food that was harvested at its peak all year long. I try to make as much of our food from scratch as possible, and even things like bread, crackers, baked goods, snacks, broth, soup, etc. can be made in big batches and frozen. This is a great way to save money. 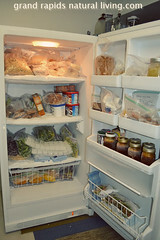 There are so many things to stock your freezer with; produce, meat, grains, homemade baked goods and meals. By the end of summer my freezers are usually packed, so how do I keep track of what is in them? Simple. I have a dry erase board on each freezer that lists all of the contents. Every time I put something in or take something out I mark it on the board so I always have a list of exactly what is in my freezer. When I need to figure out what to have for breakfast I can just look at the board and see what breakfast items I have on hand. If I’m trying to plan a dinner I can check what meat we have and if there is anything that needs to be used up. I can also see if I’m running low on any item so I can restock. 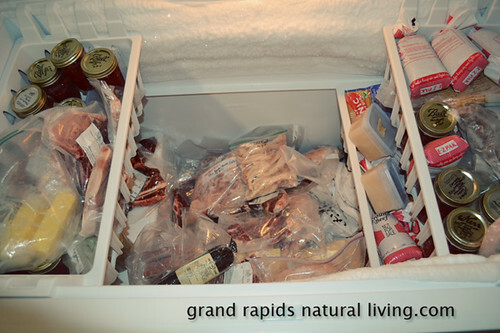 My freezers usually don’t have as much in them come springtime as we have used up a lot of our produce and meat. This makes it a good time of the year to go through and use up older items (Hmmm…I made those muffins 6 months ago. I guess that’s what we’re having for breakfast tomorrow). It’s also a great time to defrost your freezer. The fewer items you have to keep frozen during the process the better. Then you’ll be ready to restock when summer comes and fresh, local food is in abundance once more. After you’re done preserving and stocking bulk meat you can fill your freezer with baked goods all winter long. A large freezer (or two or three) is a wonderful investment that will save you money and keep you healthy. It’s easy to organize and can make your life much simpler. Do you use a freezer to help save money on healthy foods? 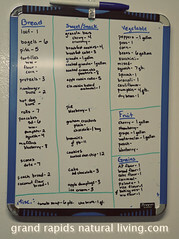 I love the white board idea on the freezer to keep track of inventory. We too love our freezers. I beef, venison, chicken and fruits and veggies. I also like the idea of freezing breads and muffins. Thanks!